Clostridium difficile (C. difficile) infection is an important cause of healthcare-associated diarrhea. Several factors such as admission of colonized patients, levels of serum antibodies in patients, and control strategies may involve in determining the prevalence and the persistence of C. difficile in a hospital unit. We develop mathematical models based on deterministic and stochastic frameworks to investigate the effects of control strategies for colonized and symptomatic patients and admissions of colonized and symptomatic patients on the prevalence and the persistence of C. difficile. Our findings suggest that control strategies and admissions of colonized and symptomatic patients play important roles in determining the prevalence and the persistence of C. difficile. Improving control of C. difficile in colonized and symptomatic patients may generally help reduce the prevalence and the persistence of C. difficile. However, if admission rates of colonized and symptomatic patients are high, the prevalence of C. difficile may remain high in a patient population even though strict control policies are applied. Control strategies and admissions of colonized and symptomatic patients are important determinants of the prevalence and the persistence of C. difficile. Clostridium difficile (C. difficile) which is a spore-forming gram-positive bacillus is a causative agent of C. difficile infection (CDI). It has become a leading cause of healthcare-associated diarrhea resulting in morbidity, mortality, and hospitalized costs to patients and healthcare institutions in many countries . For example, in the United States, it was estimated that C. difficile may be responsible for 333,000 cases per year costing approximately $3.2 billion and causing 15,000–20,000 deaths . The clinical spectrum of CDI ranges from asymptomatic colonization to self-limited mild diarrhea, severe diarrhea, life-threatening disease such as toxic megacolon and sepsis, and death [1, 3]. Although reported cases of CDI have been declining in the recent years, the incidence rates still surpass infection rates of methicillin-resistant Staphylococcus aureus in several areas of the United States and Europe [4–6]. C. difficile resides in the normal intestinal microbiota of 1–3% healthy adults and generally most colonized people with the normal gut flora remain asymptomatic . However, when the normal gut flora of patients is disrupted to conditions that favor proliferation of C. difficile, those who are exposed to C. difficile spores or those who are already asymptomatically colonized may develop CDI [7, 8]. It has been well recognized that antimicrobial exposure is an important risk factor linked to alterations of the gut flora and the development of CDI . Nearly every antimicrobial can lead to alteration and infection; however, broad-spectrum agents such as clindamycin, cephalosporins, and fluroquinolones are most frequently reported causes [1, 9]. Note that despite the considerably lower rate in comparison to hospitalized patients, low-risk populations such as individuals with no recent health-care histories, pregnant women, and children in a community setting can also develop CDI [10, 11]. Another factor that plays a crucial role on the development of CDI is host immune responses. As pathogenic effects of C. difficile are typically exerted through the production of toxin A and toxin B, patients who have high levels of serum immunoglobulin G (IgG) and A (IgA) against C. difficile toxins are normally protected from diarrhea and hence remain asymptomatic [12, 13]. On the other hand, patients who have low levels of serum antibodies are more likely to develop clinical symptoms. In addition, the high levels of serum antibodies may also protect patients from recurrence of CDI . Elimination of CDI requires restoration of gut flora and patients with mild disease can occasionally be treated by ceasing antimicrobial therapy. Metronidazole and vancomycin are first-line therapeutic agents for treating mild and severe CDI, respectively . Both are effective with 95–100% response rates for mild disease but the former is less efficacious than the latter for severe disease . 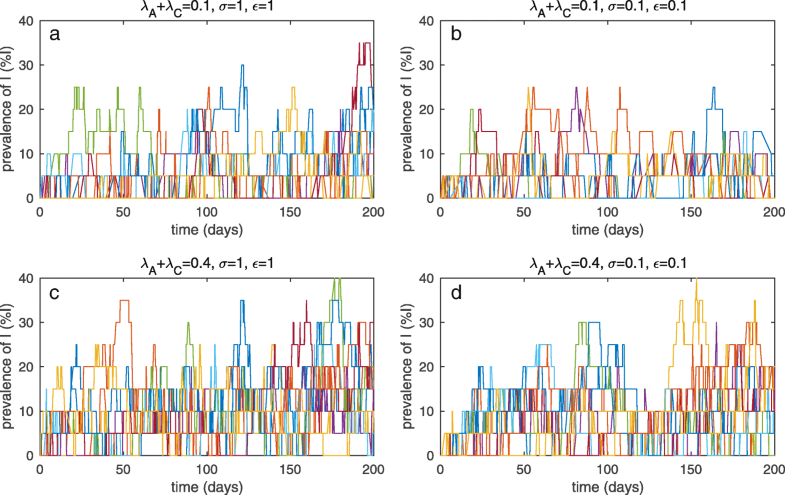 Mathematical models have been used to investigate transmission dynamics of C. difficile but they are still not numerous [15–21]. Starr et al. developed a stochastic model based on the herd immunity hypothesis of CDI outbreaks to understand C. difficile epidemiology. To determine most important factors influencing transmission of C. difficile, Lanzas et al. proposed a mathematical model for patients with and without protection against CDI and underlined an important role of colonization at admission. Rubin et al. designed an agent-based simulation model to explore six interventions on transmission of C. difficile and suggested improved hand hygiene compliance and isolation practices for suspected C. difficile cases as effective ways to control the spread of Clostridium difficile. Yakob et al. [18, 19] constructed mathematical models to investigate the efficacy of control measures, and mechanisms of hypervirulent and endemic strains of C. difficile. Codella et al. 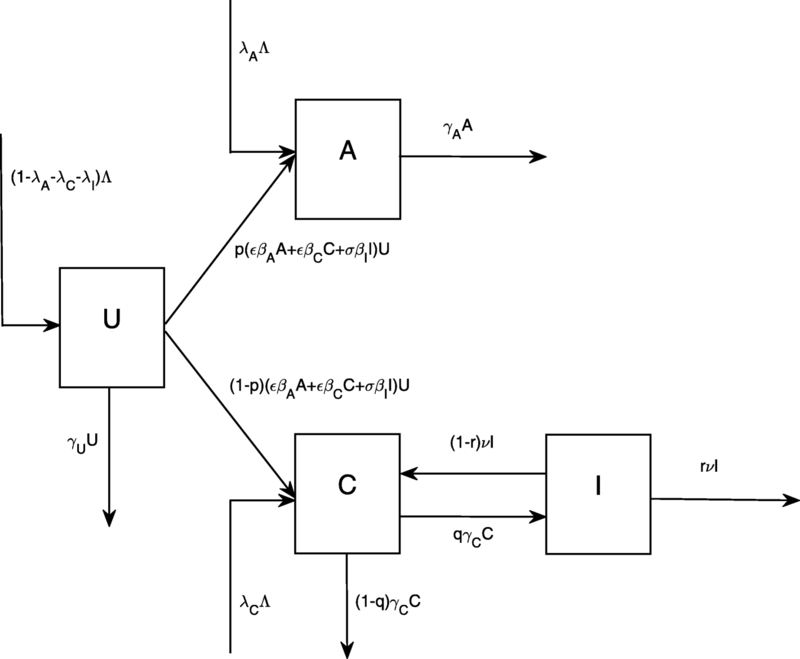 developed an agent-based simulation model for investigating infection control and estimating transition probabilities. Recently, van Kleef et al. constructed an individual-based transmission model incorporated with data of patient movements and found that vaccination may be most desirable in groups of patients who take high broad-spectrum antimicrobial agents. 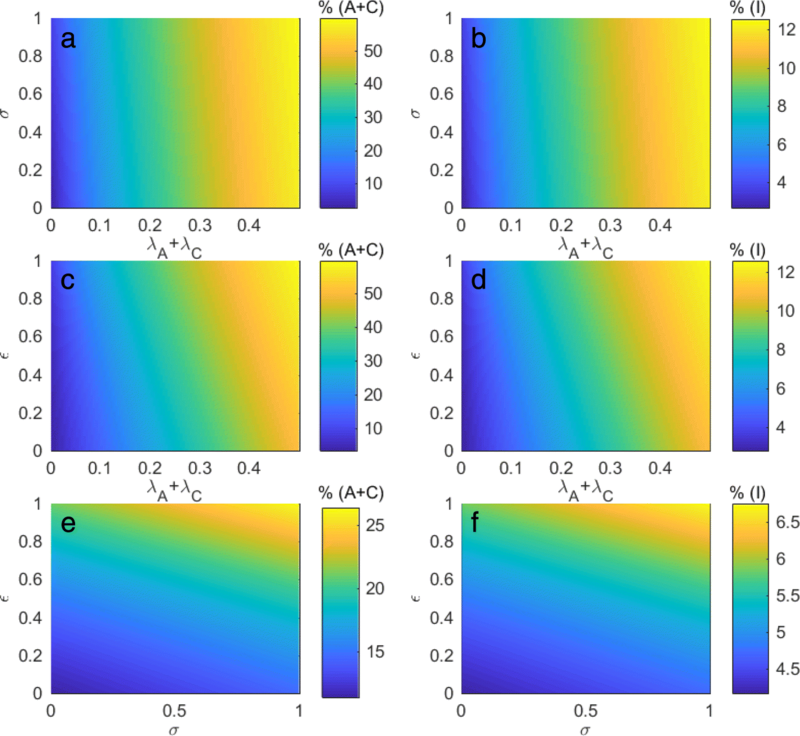 In this present study, we develop mathematical models to investigate the effects of additional control measures targeted at colonized and infected patients (e.g. isolation or cohort nursing) and admissions of colonized patients on the prevalence of C. difficile and the tendency of infection cases to be temporarily driven out. Although the emergence of CDI among low-risk populations has been increasingly reported, it has been suggested in several studies that more than 90% of hospitalized patients who develop CDI have recent antimicrobial exposure [22, 23]. Hence, in this work, instead of considering two groups of patients who take and do not take antimicrobial agents, we only focus on the former group of patients who are at higher risk and promptly affected. Our aims are 1) to investigate how additional controls targeted at colonized and infected patients and admissions of colonized patients affect the transmission dynamics of C. difficile among patients who receive antimicrobial agents and have disruption of the gut flora and the tendency of C. difficile infection to be temporarily driven out, and 2) to identify factors that may have a significant impact on the prevalence and the persistence of C. difficile. To describe the transmission dynamics of C. difficile among patients with antimicrobial exposure in a hospital unit, patients are divided into four categories: uncolonized patients (U), colonized patients with high levels of serum antibodies (A), colonized patients with low levels of serum antibodies (C), and symptomatic patients (I). Uncolonized patients are those who currently have the disruption of gut flora from antimicrobial exposure but have not yet been colonized by C. difficile. Colonized patients with high levels of serum antibodies generally remain asymptomatic and do not develop severe clinical symptoms. For those who have low levels of serum antibodies and are colonized by C. difficile, they either leave the hospital or develop clinical symptoms. The total number of inpatients in the hospital, N=U+A+C+I, is kept constant in this study to reflect the fixed number of beds and the dynamics of admissions and discharges of inpatients. It is assumed that admissions of patients are at rate Λ per day with the probabilities λA,λC, and λI of patients having high levels of serum antibodies and colonized, having low levels of serum antibodies and colonized, and having clinical symptoms, respectively. Those quantities usually vary in many hospital settings. Based on some preceding studies, the prevalence of colonized patients with toxigenic strains of C. difficile at admission is approximately 10% . It was estimated that 60% of healthy people have high levels of serum antibodies, IgG and IgA, to C. difficile even if C. difficile colonization is absent (p=0.6, where p denotes the probability of having high levels of serum antibodies) [13, 25]. We thereby assume that λA=0.06 and λC=0.04. Some previous studies also suggested that approximately 1% of admitted patients are symptomatic at admission or otherwise develop clinical symptoms within 3 days after admission [26, 27]. Consequently, we assume λI to be 0.01 in our study. In the model, discharges of patients occur at rates of γU,γA, and γC for patients who are uncolonized, colonized with high levels of serum antibodies, and colonized with low levels of serum antibodies, respectively. For simplicity, discharge rates of patients who are not symptomatic are set to be 1/5 per day, which is the inverse of the average length of stay of patients in a hospital . Moreover, such length is approximately equal to the average length that colonized patients with low levels of serum antibodies become symptomatic . Hence, we assume that after 5 days colinized patients who have low levels of serum antibodies either become symptomatic with the probability q or leave the hospital unit with the probability 1−q. Normally, q ranges from 10 to 40% [27, 30–32]. In this study, q is approximated to be 20% . For symptomatic patients, we assume that all must be treated at rate of ν where 1/ν is the average length of a treatment course and it is assumed to be 10 days [8, 33]. Mortality from CDI varies among settings and depends on the virulence of strains. It is approximated to occur in 10% of the symptomatic patients in the model [2, 22]. Moreover, in the model, patients may be unsuccessfully treated and die due to CDI with the probability r. After successful treatment, treated patients are assumed to be colonized with C. difficile again. By this assumption, the model allows recurrence to occur in some treated patients with the same probability q with the probability of developing symptoms. Transmission of C. difficile among patients is simply assumed to be density-dependent since patients normally shed a large number of spores in their stool that contaminate their hands, environmental surfaces, equipment, and hands of health care workers. This assumption is in agreement with some preceding modeling studies . Because symptomatic patients heavily contaminate their environment in comparison to colonized patients, it is assumed in this study that βI>βA=βC. According to the infection control guidelines, symptomatic patients should be isolated in single rooms with private toilet facilities to a feasible extent and contact precautions should be applied to limit the spread of C. difficile . However, it is quite often in many hospitals that control practices do not meet the guidelines . Hence, σ is incorporated in the model to reflect additional control practices targeted at symptomatic patients. There are no additional attempts if σ=1. The attempts fully prevent transmission of C. difficile from symptomatic patients if σ=0. Similarly, ε is incorporated to reflect additional control practices applied to colonized patients. with Λ=γUU+γAA+(1−q)γCC+rνI. Note that Λ depends on the dynamics of inpatients and treatment rate of symptomatic patients. The parameters used in the model are shown in Table 1 and the flow diagram for movements between compartments of inpatients is illustrated in Fig. 1. The deterministic model captures dynamics of inpatients by considering patient admissions and discharges, immune responses that prevent symptomatic cases, the development of clinical symptoms, and treatment rate. The model also takes into account additional control measures applied to colonized and symptomatic patients to prevent further transmission from colonized and symptomatic patients to uncolonized patients. where a,c, and i are the values of discrete random variables. The probabilities for describing patient transitions according to changes of disease states and demographic variability are shown in Table 2. The model is solved by the Gillespie algorithm for certain sample paths of state variables [34, 35], cumulative time in the absence of colonized and symptomatic patients, and the number of absence periods of each patient group in the hospital unit. Hence, C. difficile cannot persist in the hospital when there are no admissions of colonized and symptomatic patients if R0<1 and it is prevalent if R0>1. Since admissions of colonized or symptomatic patients often occur, we then explore the following case λA≠0, λC≠0, and λI≠0. In such case, the disease-present steady state only exists or C. difficile always persists in the patient population. However, due to several nonlinear terms in the model, analytic results are not obtainable. Hence, we investigate the effects of additional control measures targeted at colonized and symptomatic patients and admissions of colonized and symptomatic patients numerically in both deterministic and stochastic frameworks. According to some previous studies, the prevalence of C. difficile colonization in a hospital unit is approximately 10–25% . Figure 2a shows our baseline results for the prevalence of patients in each disease category for N=20. From our parameter setting, the prevalence of colonized and symptomatic patients remains at a lower level as compared to uncolonized patients. Without additional control measures applied to colonized and symptomatic patients (σ=ε=1,R0=0.57), the prevalence of colonized patients is approximately 26% and the prevalence of symptomatic patients is approximately 7%. Consequently, the acquisition rate of C. difficile during an admission is approximately 16% in our work. By varying the control factors (0≤σ≤1,0≤ε≤1) as shown in Fig. 2b, it can be clearly seen that additional control measures targeted at colonized and symptomatic patients may have a greater impact on the prevalence of colonized patients as compared to symptomatic patients. With more stringent approaches applied to colonized and symptomatic patients, the prevalence of C. difficile is reduced. Moreover, applying additional control measures to colonized patients may help reduce the prevalence of C. difficile than applying additional control measures to symptomatic patients. Figure 3a and b show the prevalence of colonized and symptomatic patients when the probability of patients being colonized with C. difficile at admission and the control factor for symptomatic patients vary. Our results suggest that changes in the probability of patients being colonized at admission have a more dramatic impact on the prevalence of colonized and symptomatic patients than changes in the control factor for symptomatic patients. Even though more strict control methods are applied to symptomatic patients (σ→0), the prevalence of colonized and symptomatic patients is still not significantly reduced if large numbers of colonized patients are admitted. Similarly, Fig. 3c and d demonstrate that the prevalence of colonized and symptomatic patients increases significantly according to the higher probability of patients being colonized at admission as compared to the control factor for colonized patients. Although more stringent control methods are applied to colonized patients, the prevalence of colonized and symptomatic patients is not considerably decreased. In addition, Fig. 3e and f demonstrate the effect of control factors on the prevalence of colonized and symptomatic patients when the probability of patients being colonized at admission is fixed. Our results suggest that the lower the control factors, the lower the prevalence of C. difficile among patients. Equivalently, improving control policies towards colonized and symptomatic patients may help reduce the prevalence of C. difficile among patients. Moreover, changes in the control factor for colonized patients may have a greater impact on the prevalence of colonized and symptomatic patients than changes in the control factor for symptomatic patients. Consequently, our results suggest improving control policies for colonized patients. When the total number of patients is small (N=20 patients in this study), random effects may have an impact on local extinctions and reemergence of C. difficile among patients. In this work, admissions of colonized and symptomatic patients are present in the model. Hence, even though C. difficile becomes extinct, it can shortly reemerge again in the patient population as a consequence of new admissions of colonized or symptomatic patients (see Fig. 4a–d). Figure 4a–d show that the prevalence of symptomatic patients has a tendency to decrease and symptomatic patients are more likely to be absent in the hospital unit when more stringent control policies are applied to colonized and symptomatic patients (σ→0,ε→0). Note that 1) only 20 realizations of stochastic results are shown here while 800 realizations are used for calculating the average quantities associated with stochastic results, and 2) our stochastic results are simulated for 200 days. We further investigate the cumulative absent time for each group of patients in a hospital and the number of absences of each group of patients (see Table 3). The cumulative absent time for each patient group is calculated from the average total time that any patients in each disease category are not present in the hospital unit (when A=0,C=0, or I=0) of 800 realizations and the absent number is calculated from the average number of absences of colonized or symptomatic patients on the time domain. Hence, the former term reflects how long colonization or infection is absent in the hospital and the latter term reflects how often patients in each group are not present in the hospital. When stringent control approaches are applied, the cumulative absent time for each disease category and the corresponding absent number increase. For the absence of symptomatic patients, due to the much longer absent time, the absent number remains the same in the results. Our results in Table 3 also demonstrate that applying stringent control policies to colonized patients may result in longer cumulative absent time of colonization and infection and higher absent number. These results are in agreement with the deterministic results. In Fig. 5a–d, when the total number of patients is large (N=100 patients), stochastic effects have a smaller impact on temporary extinctions of C. difficile among patients and hence local extinctions of C. difficile rarely occur. The prevalence of symptomatic patients is reduced when more stringent control measures for colonized and symptomatic patients are applied (σ→0,ε→0). However, if very large proportions of colonized patients are admitted, the prevalence of symptomatic patients still remains high even though additional control measures are applied to colonized and symptomatic patients. 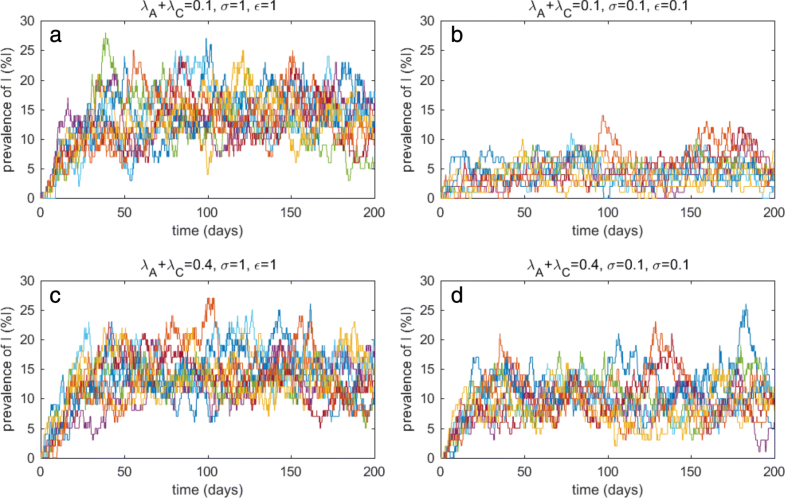 To investigate transmission dynamics of C. difficile among patients with disruption of the gut flora in a hospital setting, we develop mathematical models based on deterministic and stochastic frameworks. The models are employed to explore the effects of additional control measures for colonized and symptomatic patients and admissions of colonized and symptomatic patients on the prevalence and the persistence of C. difficile. The basic reproduction number (R0) is calculated when there are no admissions of colonized and symptomatic patients. The quantity suggests that the prevalence of C. difficile depends on several factors such as transmission rate, control strategies, the proportion of colonized patients who have high or low levels of serum antibodies, discharge rates, etc. For example, improving control policies for symptomatic patients results in decreased values of σ and R0 and that can lead to the lower prevalence of C. difficile among patients. In this work, R0 is set to be approximately 0.57 based on a value provided by preceding studies (R0∼0.55−1.99) [16, 29]. Without admissions of colonized and symptomatic patients, C. difficile would die out from the patient population. According to the setting, transmission coefficients are approximated when additional control measures for colonized and symptomatic patients are not included (σ=ε=1) and it is more likely that the coefficients already take into account certain control policies for preventing the spread of microorganisms in general patients. In general, colonized or symptomatic patients are often admitted to a hospital unit. Hence, we consequently investigate the prevalence of C. difficile when there are admissions of colonized and symptomatic patients. Based on our baseline result, the prevalence of colonized patients is approximately 26% which is quite close to the 10–25% range of colonization of C. difficile in hospitals in preceding studies [31, 38]. From the results, we obtain the acquisition rate of C. difficile in the hospital at 16% which is in agreement with the range 4–21% of C. difficile acquisition rates in some previous studies . Moreover, we demonstrate that control strategies and admissions of colonized and symptomatic patients play important roles in determining the prevalence and the persistence of C. difficile in patients. Applying additional control measures to both colonized and symptomatic patients may help reduce the prevalence of C. difficile. Our results also suggest more stringent control policies for colonized and asymptomatic patients to obtain the lower prevalence of C. difficile. In addition, our results highlight a greater impact from admissions of colonized and symptomatic patients even though stringent control policies are applied. Furthermore, based on our stochastic results, the prevalence of C. difficile infection fluctuates over time which is relatively in agreement with infrequent occurrences of C. difficile infection in other preceding works . Our results suggest the tendency of C. difficile colonization and infection to be temporarily driven out when stringent control policies are applied to colonized and symptomatic patients. However, when admission rates of colonized and symptomatic patients are high, the absence of C. difficile colonization or infection from the hospital unit is less frequent. Moreover, our stochastic results are in agreement with the deterministic results to underline how the presence of colonized and symptomatic patients at admission affects the prevalence of C. difficile and to promote strict control policies to be applied to colonized or asymptomatic patients. An important limitation of this study is from our parameter setting as there is no single study providing all the parameter values used in the model. Note that here parameters are sourced from multiple settings. Another limitation is the assumption that exposure to C. difficile is proportional to the presence of colonized and symptomatic patients without taking into account other possible sources or reservoirs from health-care workers or visitors. A further limitation of our work is from our stochastic results. Due to the very long execution time, only 800 realizations are used to calculate the absent time and the absent number. Finally, we believe that our findings may help researchers, practitioners and public health to gain insights into how control strategies and admissions of colonized and symptomatic patients affect the prevalence and the persistence of C. difficile and may perhaps help suggest control strategies to reduce the spread of C. difficile in hospital settings. Future directions of this work would be to extend the model to include recurrent CDI. This work is supported by the Thailand Research Fund (TRG5880139) and Mahidol University. FC and PP designed the study. FC developed the models, performed the analytic calculations and the numerical simulations, interpreted the results, and wrote the manuscript. Both FC and PP read and approved the final manuscript.